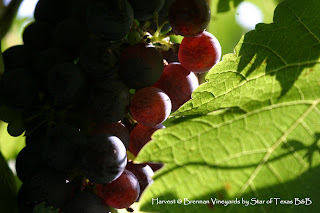 Texas Wine Trail Month is the whole month of October, we at Star of Texas Bed and Breakfast got in on the adventure of harvesting grapes. Our outing took us to Brennan Vineyards in Comanche and we watched as the machines harvested the grapes, dumped them into the bins and then transported to the de-stemming machine, that roared like a dragon as the grapes went through and watched them pass before us headed to the stainless steel vats to do what Brennan does best, make great wine. We then ventured out to the fields again with clippers in hand and experienced the hand picking and what an awesome morning it was. I being raised on a cotton farm can truly appreciate the hand harvesting of any crop. Loaded down with our bags of fresh picked grapes we head home and started to press the juice for grape jelly and my friend ventured so far as to try his hand at, yep you guessed it, homemade wine. It was a great day, I leaned so much about the grapes being harvested and got to feel like a young farm girl again. Visit and support all our Texas Winery’s this month and enjoy the harvest.